Ten Air Niugini cadet engineers, including two women, have started on the job training with Hawker Pacific in Cairns, Australia this week. It follows their two year training stint with Air New Zealand’s Aviation Institute in Christchurch, New Zealand – which the engineers completed last month. Early this week the cadets were in Port Moresby for their break before leaving for Cairns. Their job training includes nine months of aeronautics which covers 10 basic modules. These modules are divided into avionics and mechanics – two essential trades in aircraft engineering. Cadet Engineer Solomon Kawage spoke on behalf of the group when he said the two years training in New Zealand were challenging yet exciting for them. “We were exposed to bigger aircraft and had the chance to work alongside people from other nationalities. We were also exposed to new weather,” he said. Linda Eremas, another cadet, said they are grateful for the opportunity provided to them by Air Niugini. She has a few words of advice to the up and coming cadets. Every year Air Niugini invests heavily in the training of its staff, including cadet engineers and pilots. The cost of training a cadet engineer over a four year period is K600, 000.00. Air Niugini’s total training budget for this year is K16.5million. The Board and Management of Air Niugini will also be investing in Hangar facilities at Jackson’s airport that will eventually allow heavy maintenance of aircraft to take place in Papua New Guinea. This will not only reduce overseas expenditure but also help increase PNG’s engineering capability. 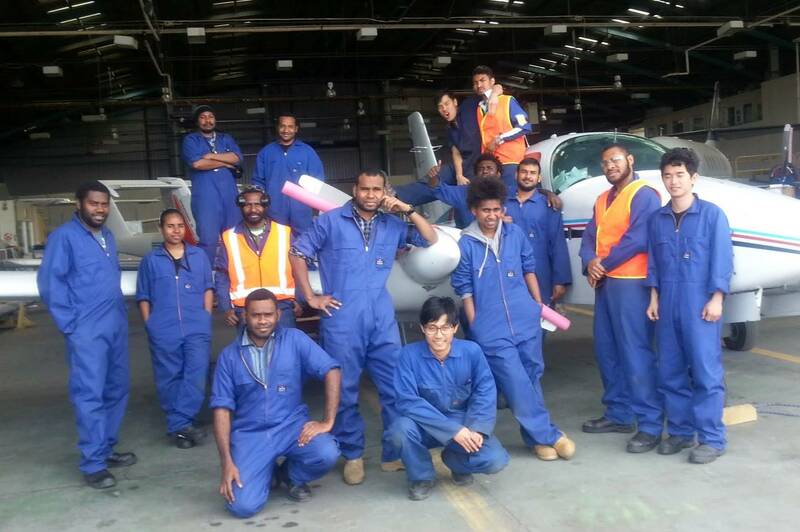 Air Niugini reintroduced the Aircraft Maintenance Engineer Cadet Scheme four years ago. It’s an intensive recruitment and selection process with strict criteria – candidates must be between eighteen and twenty-five and have completed a minimum Grade 12 education with an A or B pass in Physics, Applied Maths, Maths A and Applied English. PETT certification is also beneficial. The program aims to develop candidates into Licensed Engineers by partnering with Air New Zealand. After four years of training with Air New Zealand’s Aviation Institute, successful candidates will be awarded a European Aviation Safety Agency (EASA) basic licence. Currently Air Niugini has a total of 39 cadets, including six women, training in New Zealand and Australia.